A few weeks ago, for the first time in my life, I walked up to a bar and ordered myself a cocktail. On an airplane, I mean. You can wax nostalgic about the long-ago days of the Pan Am flying boats, when tuxedoed stewards served caviar on the finest china, and passengers retired to Pullman-style sleeping bunks (only 37 hours from New York to Rio!). But the truth is, up in the forward cabins of the world’s elite airlines, flying has never been more downright luxurious than it is right now. It’s a sleeker, 21st-century style of luxury, but there’s no denying it. Others agree. 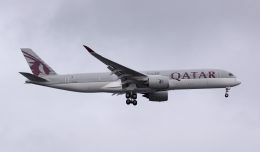 Maybe you caught David Owen’s recent New Yorker piece, “Game of Thrones,” about the investments that carriers have been making in their first and business class cabins, and the remarkable transformation of high-end business travel. Earlier this month, Joe Sharkey wrote a similar story for his “On the Road” column in the Times. This was an Emirates flight from Bangkok to Dubai, leg number four of an east-to-west global circumnavigation, and my first-ever ride on the mammoth Airbus A380. Emirates currently operates about fifty A380s. The upper deck is split between 14 fully-enclosed first class suites and 76 business class cubicles in a four-across, 1-2-1 configuration. My cubicle was a window seat, left side, about midway down the cabin. The seat is a full-flat sleeper with a console and minibar to one side (see photo above). It’s not a totally enclosed suite like you’d find in first class, but the chair is set deeply within the cubicle. You feel cozy and ensconced, and the side console acts as a privacy barrier, putting a good deal of space between you and the aisle (or, if you’re in the center section, your closest seat-mate). Window seats have thigh-level storage compartments along the side, similar to those in the upper deck of the 747. All seats have a small minibar, conveniently placed USB and power ports, and a shoe locker. The window shades are electrically controlled. Emirates ICE system (Information, Communications, Entertainment) is accessed via touch-screen or through a remote-control handset. There are more than a thousand movies, television and music options to pick from (including a large number of films from India, China, and elsewhere; this is Emirates after all). The video screen is huge and crystal clear, and the carrier’s noise-reduction headsets are the most comfortable I’ve ever worn. 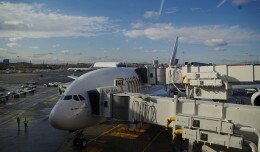 On the information channel passengers can choose between three different external camera views, including one from high atop the A380′s tail. Inflight wi-fi and mobile phone calling are available for a fee (the wi-fi is reasonably priced; cell calls are expensive). If you’re not an Emirates regular, you might have some trouble deciphering the workings of the various seat and ICE controls. During boarding, one of the cabin attendants sensed, quite correctly, that I had no idea what I was doing and kindly gave me a tutorial. The cabin lighting is changed depending on the phase of flight. For boarding it’s a soft red. The purser’s pre-departure announcement reminded passengers that the evening’s inflight staff “speaks seventeen languages.” No real surprise, Emirates being the most global of global carriers, but I have to ask: does somebody actually count? Next came a PA from the cockpit. As with its cabin attendants, Emirates’ pilots are a polyglot of expats. Our captain was a Brit and the first officer was from Jamaica. There are separate menus for the meals and wine. The food is served on Royal Dalton china. There was only one meal service, however, which I found a little stingy for a relatively long international flight. Later, a crew member came around offering mattress pads. I declined because I didn’t see the need; my seat was plenty comfortable for sleeping as it was. In the 180-degree position, there’s ample tossing and turning room both at the feet and shoulders. Behind the last row of business is a spacious lounge with a pair of sofa-style bench seats for a dozen or so passengers. The benches have seat belts, so you’re welcome to stay during turbulence. That’s where I had my vodka tonic. There’s a full bar staffed by a flight attendant, and a countertop spread of pastries and hors d’oeuvres. 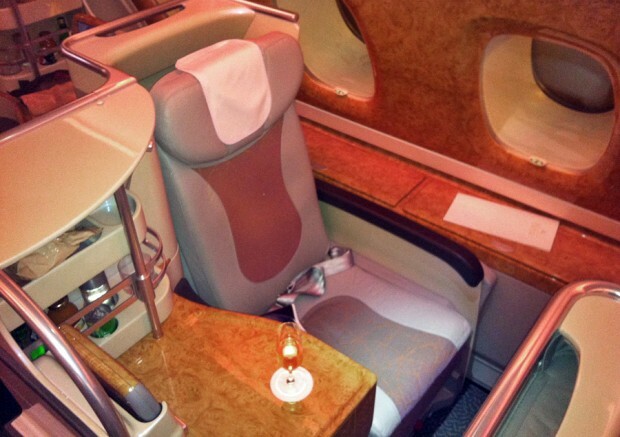 Now, as maybe you’ve noted from the photos, Emirates’ cabin decor isn’t in line with everybody’s tastes. The details are a touch ostentatious, in a certain Arabian-luxe sort of way. But it’s hard to complain. As you’re sitting there, all that gold trim and gleaming faux-wood only enhances one’s guilty pleasure. As my old friend James Kaplan once put it, it’s Vegas, but Vegas in a good way. I’ve been ridiculing the A380 for years, calling it, among other insults, “a travesty of industrial design” and “the ugliest commercial jetliner ever built.” It remains both of those things, at least on the outside. On the inside, however, I have to admit there’s little to complain about: the plane is spacious and comfortable. It’s also remarkably quiet – maybe the quietest jet I’ve ever flown on. Even during takeoff the only sound was a deep, distant rumble and some rattling from the galley. Down below, meanwhile, was the economy cabin, with as many seats — 427 — as an entire Boeing 747. Because the upper deck has its own boarding door and dedicated jetway, I never saw economy – or first class for that matter, with its shower and fully enclosed passenger compartments — is cordoned off by curtains and decidedly off limits to the curious. The main benefit of this segregation is a much quicker boarding process, but one drawback, perhaps, is that the experience feels less like flying on an airplane than merely relaxing in some cavernous rectangular function room. This feeling of disconnectedness is exacerbated by the poor view from the upper deck windows, which are mounted deep within the side panels and angled upward. I much prefer the oversized windows of the 787. The fifth and final leg of my round-the-world journey was a 13-hour nonstop from Dubai to Boston. Emirates began its Boston service this spring using a once-daily Boeing 777-200. The airline has around 150 777s, but relatively few of the smaller -200 variants. Already the Boston service is popular, especially with passengers connecting to and from India, and I won’t be surprised to see a -300 on the route soon. Business class on this aircraft isn’t nearly as fancy as on the A380. It’s a standard, forward-facing recliner with a retractable privacy barrier — comfortable, though a bit of a let-down after being so spoiled on the A380. And seven-abreast (2-3-2) is a rather tight fit on a 777, even with a full-flat sleeper. By the way, those side-mounted screens you see above, and in the earlier photo of the A380′s console and minibar, are the removable seat control panels, not the ICE video screens, which are much larger and mounted to the seat-back in front of you. The 777 has textured sidewalls and constellation patterns that illuminate through the ceiling panels. The bulkheads are decorated with fresh flowers (I checked; they were real) and a desert dune motif. Emirates’ business class amenities kit is the largest I’ve ever seen, though not necessarily the best stocked. Two essentials are conspicuously absent: earplugs and a pen. And somewhat oddly, slipper-socks and eyeshades are supplied separately, in a plastic bag of their own. And the meal service. Although Emirates’ menu has some great multi-ethnic entree choices, I was disappointed by the presentation. At my own carrier, the business class meal presentations are very choreographed. The wine, cheese, and dessert courses, for instance, are elegantly served from an aisle cart. At Emirates the whole thing feels random and discombobulated, with flight attendants running to and from the galley with plates and trays. On the Boston flight, breakfast was served shortly after takeoff. Choices were an omelet, a mixed grill, paneer bhurji or a cold plate of meats and cheeses. The mixed grill was very good, if skimpy on the portion sizing. Apparently you have to ask? About two hours later it was lunch time. Steak, prawn biryani, or chicken tikka masala. While the service felt disjointed, the staff were nonetheless gracious and attentive. Despite having to ask for that snack, there was never a time when a flight attendant wasn’t nearby. Walk-throughs were constant. In this regard there is no comparison with most American carriers, where, once the meal service is over, cabin crew promptly disappear. Passing near Isfahan, Iran, on the DXB-BOS leg. By the way, if you exclude the U.S. domestic market, Emirates is now the largest airline in the world measured by RPKs. The carrier takes advantage not only of a strong local population, but ideal geographic positioning — its Dubai hub is a perfectly placed transit point for the millions of people traveling between Europe, Asia, Africa and the Americas. Though I have to say, I was quite underwhelmed by Dubai airport. Emirates’ celebrated concourse A, opened in 2013, manages to feel awfully claustrophobic for such a gigantic building. There are too many shops and not enough pedestrian space, with overcrowded corridors and absolutely nowhere to relax, every gate and seating area jam-packed with passengers and their endlessly shrieking children. I imagined a city-state. It was a huge new metropolis, purpose-built from scratch — like Brasilia or Abuja, except much bigger. A gleaming new capital of the world. As a global crossroads, my city-state needed a strategic location, equidistant between the world’s most populous regions. The spot I picked was along the Mediterranean coast of eastern Libya, where an atlas told me (perhaps not entirely accurately) there was ample empty space and access to the sea. But it wasn’t sea routes that I was interested in. My reason for creating this imaginary place was to create the imaginary airline that would have to come with it. 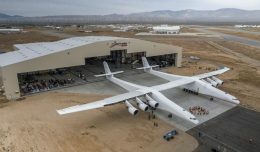 It would be one of the biggest airlines in the world. Bored at school, or in the evenings at the dining room table after pretending to finish my homework, I would sketch out the route network of this fictitious carrier. I’d mark off my capital city (it never had a name, and neither did its airline) with a red circle, and from there the lines burst outward like a great spiderweb; down into Africa, up into Europe, through the Middle East and into Asia. I got pretty specific: flights to Kinshasa went nonstop, but getting to Jakarta required a layover in Bombay. We served Victoria Falls three times weekly for the benefit of European safarigoers. Other destinations were undecided. Taipei? Should we fly to Taipei, perhaps through Hong Kong, or via our prized route to Guangzhou? I could sit for an hour or more pondering the network choices of an imaginary airline. I went so far as to determine which aircraft types were assigned to various routes, and drew meticulous seat maps (two-class cabins on the shorter routes, three classes for the long-hauls). Each individual plane was christened after a different world city, mountain peak or river, and this name would be lettered along the forward fuselage — in the style of KLM’s planes (“Kilimanjaro” — what a fantastic name for a jetliner). Naturally we had a lot of 747s. I created blueprints for a spectacular hub airport, including detailed sketches of the terminal and the world’s grandest control tower. There would be two pairs of runways, parallel-staggered so that planes never had to cross the adjacent strip. Advanced 3-D versions of this airport involved a terminal built with Legos and runways laid out with masking tape. In many respects a version of this fantasy actually came to exist. The place where it happened is Dubai, and the airline is Emirates. I don’t know, maybe I fell into the wrong line of work. Looking back, it’s curious the way seating charts and route maps infatuated me as much or more than cockpits did (a backyard project to construct a replica 727 cockpit using plywood and spare electrical parts never came to fruition). Mine was a peculiar route to pilothood. I have never met a colleague whose formative obsessions were quite like mine. While I was outlining terminals and fantasizing about Taipei, they were probably at air shows watching the Blue Angels, or at the local airstrip watching Piper Cubs practice touch-and-goes — two things that would have bored me to tears. Pilots, as a general rule, are not into airlines. They are into flying. You could say I’m into both. I love what I do for a living, don’t get me wrong, but I also would enjoy being on the side of the business that builds, plans and strategizes. I want to be the guy who launches the new routes and decides which planes to deploy on them. (Why does no US carrier fly to Poland? Mine would.) I want to be the person who chooses the livery and logo; the person who picks the seat designs and the color schemes in the cabin (green; we don’t see enough green). I’d be good, I think, at branding. My rendering of a Delta L-1011, circa 1975. Here’s another fantasy: A seaplane shuttle between Boston, New York, and Washington. Imagine stepping onto a plane on the banks of the Potomac, or at the downtown edge of Boston Harbor, and stepping off again 45 minutes later at a pier on the Hudson River, a block or two from the subway. Imagine being within walking distance of the airport — at both ends of your journey. Easy-on, easy-off. No lines, no congested taxiways. Of course, this particular daydream is fraught with almost as many complications as building a giant metropolis from scratch on the coast of Libya. You’d need an economical, relatively high-capacity seaplane built to airline specs — one of which does not exist. (Could you put a Q400 on floats, I wonder?) And what of those days when the waterfront was frozen or fogged-in? There are no ILS approaches into the Hudson. I don’t care, it’s still a neat idea. Maybe Richard Branson or somebody could make it work. 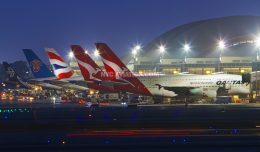 Most of you would amazed by the sheer number of airlines that already do exist in the world. We can haggle over the definition of an airline, but My J.P. Worldwide Airline Fleet Directory is over seven-hundred pages long, with detailed entries for nearly three thousand commercial operators on six continents — from giants like United, Delta, and the aforementioned Emirates, to single-plane bush outfits in Tanzania. I’ll pick the volume up, open to a random page and start scanning. I’m ashamed to admit how much time I can spend with this book. In a lot of ways it’s the oddball companies that intrigue me: the shady African freight-haulers with their unpainted Antonovs registered in Kazakhstan; the sightseeing outfits in Nepal; the Russian and Turkish charter lines; the old 727, or even a DC-3, tucked away somewhere in Latin America. “Niche carrier” is a term we don’t hear much anymore. These are small independent airlines in business to serve a very specific market. They are content in their smallness, able to make do without fancy code-shares or partnerships. They’re still out there, even in America. Here on the East Coast, for instance, we’ve got the feisty and resilient Cape Air, whose twin-engined, nine-passenger Cessna 402s have a been a fixture at Boston-Logan for many years, carrying commuters and vacationers out to Cape Cod and the Islands, up into northern New England and westward into New York State. The airline runs separate, satellite operations out of St. Louis, San Juan, and Guam. And although Cape Air code-shares with JetBlue, it wears its own livery, retaining a distinct identity and company culture. Cape Air is maybe the closest thing to what we used to call a “commuter airline.” Today we hear of “regional airlines,” but this is a relatively new term, and really a new business model. The commuters, as we knew them, carried people from small, outlying cities into the majors’ hubs. (Here in the Northeast we had Bar Harbor Airlines, Air New England, Pilgrim and PBA.) Commuters fed the major carrier networks, they did not fly on behalf of them. The commuters went where the majors couldn’t. You rode a commuter plane from Pasco to Seattle, or from Rutland to Boston. You didn’t ride one from New York to Houston, the way you can nowadays. Not long ago I came across an old aerial photograph of LaGuardia airport. It was taken from a few thousand feet, looking straight down at the terminal complex. 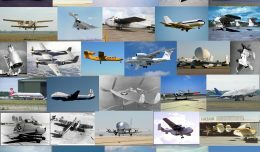 Judging from the aircraft types, I dated the picture somewhere in the mid to late 1980s. What most struck me was an almost complete absence of regional planes. There were three or four commuter turboprops, but everything else was major-league metal: 737s, 727s, even some widebodies: 767s, DC-10s and L-1011s. That same view today would be dominated by 50, 70, and 90-seat RJs, with mainline aircraft a minority. Over the past two decades the regional sector has come to account for a full fifty percent — one half — of all commercial departures in America. That’s simply astonishing. How did this happen? One way it happened is that the majors learned that it was cheaper to farm out a lot their flying to regional affiliates than to do it themselves. Regional airline employees earn a comparative pittance, while technological advances in small jet design made even longer journeys viable on a cost-per-seat basis. One can hardly blame them. And with the right coat of paint on the fuselage, who would know the difference? Nowadays the vast majority of passengers can’t even tell you which airline — whose plane, whose pilots, whose mechanics or whose flight attendants — is actually operating the Canadair or Embraer jet they’re sitting on. It’s good and bad for the passenger, I guess. There are RJs going everywhere, all the time. They’re fast and safe and relatively comfortable (certainly compared to the commuter planes of old). On the downside, they’re an inefficient use of air and ground space, and a prime contributor to congestion and delays. Getting back to that desktop airline of my youth, with my route maps and Legos. How old was I, you’re wondering? I’m not saying, except that I was probably older than I should have been. I still dabble in imaginary airlines from time to time, if I’ve got nothing to do or if somebody sticks a blank sheet of paper in front of me. I sketch routes, logos, liveries and the occasional seating diagram. For example, the South American nation of Guyana no longer has its own national airline. So, bored one night at my desk, I invented one. Its logo and livery were an adaptation of the “Golden Arrow” of the Guyanese flag. Yellow and green. Miami, Port of Spain, New York and Toronto (a lot of expat Guyanese in YYZ) were on the route map. Cessna Caravans had the in-country routes, and a Dash-8 few daily up to Caracas and over to Paramaribo. Could an old 767-200 make money on a route between Georgetown and London, maybe with a stopover in Trinidad? I’m not sure. But it’s fun to think about.